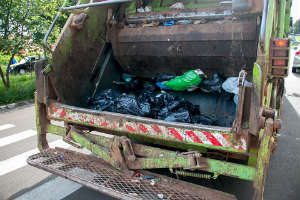 CHARLOTTE, NC – A crash involving a garbage truck occurred over the weekend in Charlotte. Unfortunately, the Charlotte crash resulted in a fatality. In fact, a thirty-three-year-old man died due to the crash, which occurred in south Charlotte. The man has been identified as Colby Charles Davis. The incident occurred just before 2:00pm on Saturday, at the 9900 block of S. Tyron Street. According to the Charlotte-Mecklenburg Police Department, Davis drove a 2005 Toyota Camry. After an initial investigation, police believe that Davis turned left onto S. Tyron Street from Nevada Boulevard. Then, he was driving south, but in the northbound lane, on the incorrect side of the median. When Davis attempted to turn right and cross the center of the grass median, the 2001 Mack 600 garbage truck struck him. The garbage truck was traveling north. According to police investigating the incident, both of the drivers had seatbelts on at the time of the Charlotte crash. However, the driver of the garbage truck was not speeding, nor was he impaired in any way. But, they suspect that Davis may have been under the influence of alcohol during the time of the incident. This would explain his erratic driving behavior and actions that led to the crash. As a result, police are still investigating the incident and waiting on test results to confirm. More information should be available to the public once it is known.